- Single clamp perfect binder with easily adjustable book clamp. - Cover nipping station with facility to control the nipping pressure. - Single clamp with easy adjustable book clamp. We are here with our new services for Perfect Book Binding. 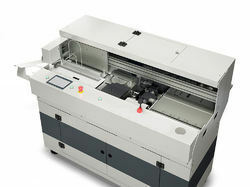 We have the latest technology for fastest and quality perfect binding. Book Clamp easily adjustable with handle and applies unilocm ptessure on each book Spine preparation consists ot a combination at noeching tool and dust cutmts. The height adjustable toughening neem ensure etlective exposure of the paper fibre. Working Speed: 2000 or 2500/hr. Single Clamp perfect book binding machine is widely used for bounding Note books, text book and registers with a speed of 600 book per minute with less maintenance, it has a powerful cutting section a dust exhustor and nipping unit with variable pressure. Timing facility is avaible for both Nipping and delivery section.